Regular readers of this blog (few as you are!) 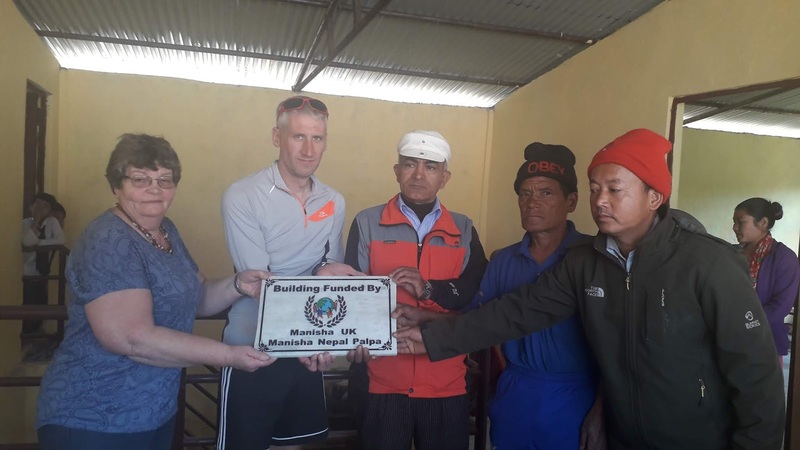 will know that we had been experiencing some difficulty with bank transfers between the UK and Nepal, which was delaying work on the Learning Resource Centre. I'm absolutely delighted to say that these difficulties have now all been overcome, the first funding payment has arrived and we're getting back to work on getting the centre ready for action. Since the money arrived on Sunday, we've signed agreements for doors and windows, as well as furniture for the library and office. We've more contractors to meet this week; we should have more agreements signed in the coming days. As frustrating as the wait has been, I think it was right that we took a cautious approach, not transferring any large sums of money until we were certain we had a secure transfer route. It's far better to put work back a couple of months than to see significant sums of money vanish. As it is, we haven't lost any money during this time, although I may have lost some hair by pulling it out! 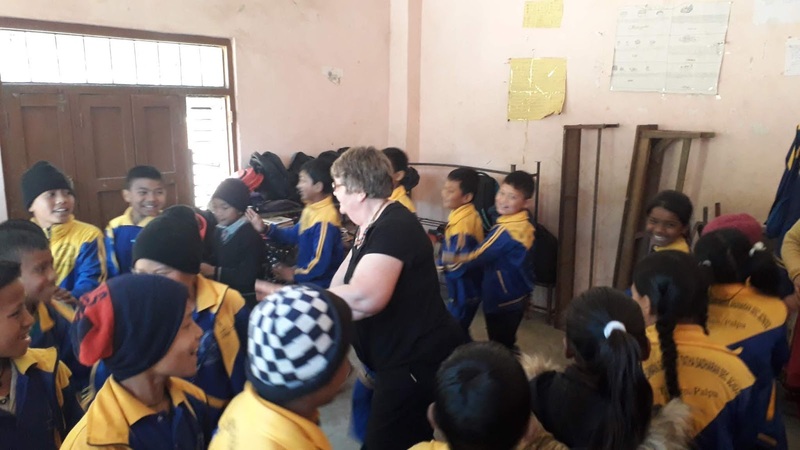 Barbara has now returned to the UK, after a great effort to get around and visit all our supported schools in Palpa. It was great having her here, really helping to get things done and making some very enjoyable school visits. We also had a fantastic meeting with the headteachers, who all shared news of their schools progress over the last year, and their plans for the year coming. We really have seen some excellent progress, especially in terms of infrastructure and there are certainly some ambitious plans to watch out for. 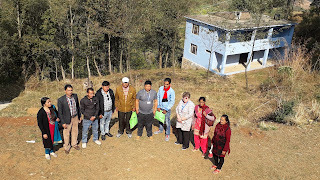 While visiting Himalaya Primary in Mahachap, we were able to make an official handover of classrooms that we funded after the earthquake. The difference between the old and new rooms is unbelievable and the students were clearly excited to be learning in the bright new classrooms. Schools are now on holiday, with the exception of a few students who still have some exams left to sit. 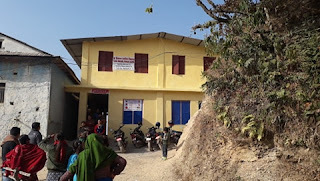 Despite schools being closed, it promises to be a busy end to the Nepali calendar year for Saran and I, as we try to make up for lost time by getting the LRC up and running as quickly as possible. During the downtime, I have been able to get lots of lessons prepared and fully form a few ideas. I also managed to sneak in an extra race that I didn't think I would have time for, running 55km from 'Monkey Temple' to Buddha Stupa in Kathmandu. Running 55km is hard, but the views are rewarding! 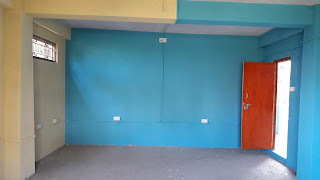 For the most regular updates of how our work at the LRC is progressing, please check our Facebook page where I post photos of the work as it's going on. There should be plenty done by the time I write my next blog post here! 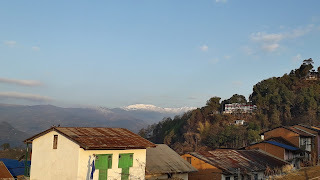 After arriving back from my last race in East Nepal, I was only in Tansen for a couple of nights before getting back on the bus to Kathmandu. This time I was heading there to meet Barbara, a Manisha UK trustee and annual visitor to Nepal. While in Kathmandu I renewed my visa for another 5 months. In the past this has been a painful process, spending 3 hours or more in the immigration department, using online forms that don't work properly and being left waiting for hours at a time. The layout and system has changed since my last visit, and credit where it is due, it is very much improved. I was in and out in under an hour, with no problems or hassle. Unfortunately, the banks haven't managed the same level of efficiency and we're still struggling to transfer funds from the UK to allow work to continue of the Learning Resource Centre. With Barbara here, we've started a round of school visits, racing the clock to visit them all before exams start in the middle of the month. A challenge not helped by a 'banda' or strike in government schools today! 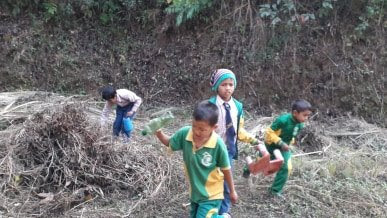 First was the short trip to Devwani School in Tansen. I visited not so long ago and wrote here about the improvements they had made. 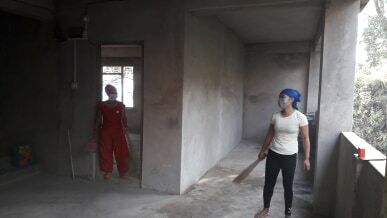 Barbara seemed equally impressed and it's great to see the school making such progress. Once the Learning Resource Centre is open, they are a in a great position to really benefit and go from strength to strength. Next was another fairly short trip to Jandeep. 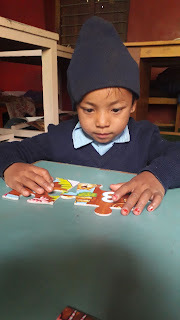 Barbara spent time in the nursery class and the library singing songs and doing jigsaw puzzles. Thanks to funding from Jandeep's UK twin school, I was able to take a computer hard drive with movies that students are expected to review during their exams, but which none of them have seen! The school is fortunate to have a large screen, so class 10 will be able to see the film before they review it in their exams this month. Plenty more school visits are planned, but of course, it all depends on schools being open! Hopefully, they'll be back to business as usual tomorrow! I arrived back in Tansen at the end of this week after a long journey to east Nepal, where Bimala and I went for the Bhojpur trail race. We broke up the very long journey to Bhojpur with an overnight stop in Kathmandu, where I spotted this. Adverts for races always catch my eye, despite Bimala's best efforts to hide them from me. 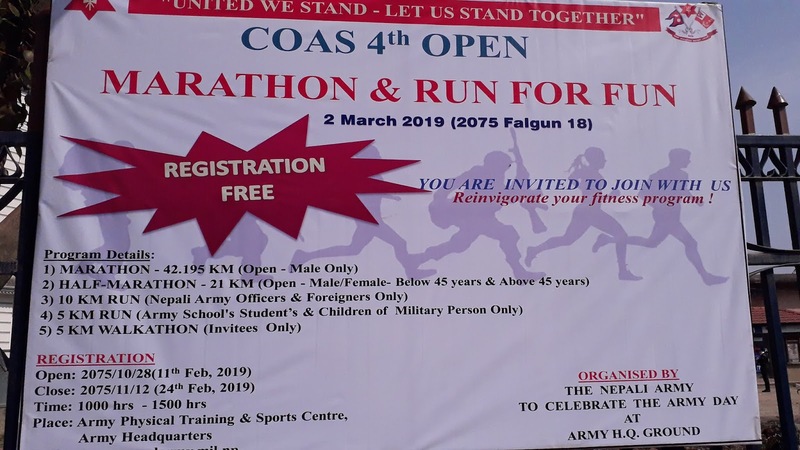 But this is one race I've no interest in joining, with the incredibly sexist discrimination against women in the marathon (you can see clearly on the poster, the marathon is open to males only). This is a horrendous policy for the 21st century (or indeed, any century, but we should really all know better by now). 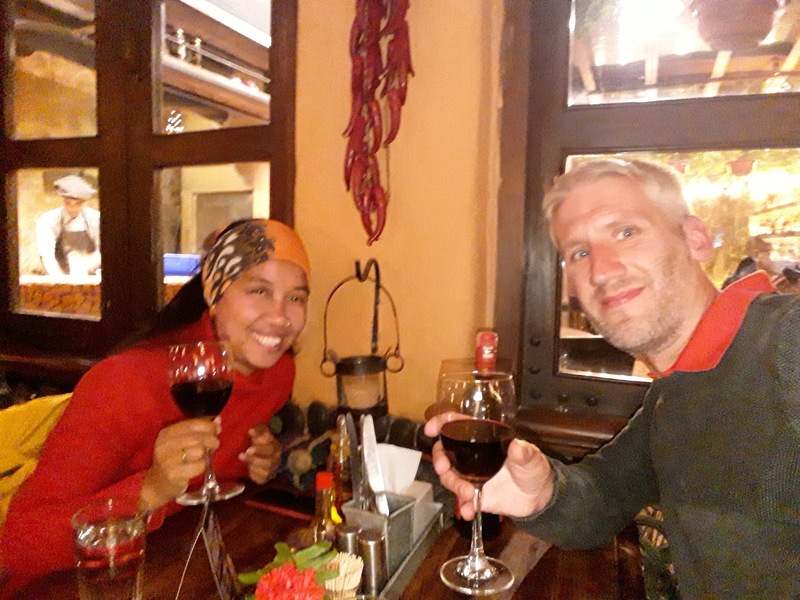 Nepal is a country with some amazingly talented runners, male and female, and the most famous and successful runner the country has produced to date, Mira Rai, is, of course, female and wins ultramarathons all over the world! After a night to recover from the 11-hour bus journey between Tansen and Kathmandu, it was time to join the other athletes on the race bus going to Bhojpur. This was a much more basic bus, for the 20-ish hour journey to Sanodumma, the village where the race would start. Not an easy journey, especially as we got closer to the village and the pitch topped road became rarer and gave away to jeep tracks. But traveling with some of Nepal's best up and coming trail runners, and (I'm fairly certain) catching my first glimpse of Everest, made the trip a little less unpleasant. To most readers outside of Nepal, Sherpa is a job description. In reality, it's actually one of the ethnic groups that make up Nepal. 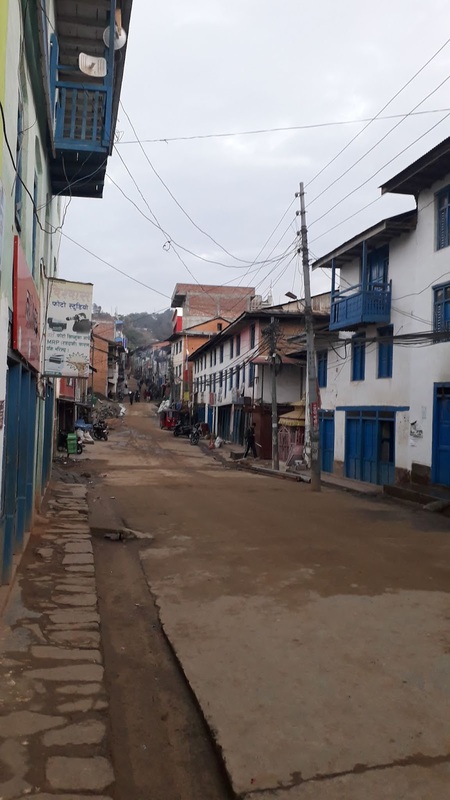 Most of the villagers in Sanodumma are from this group and while their village wasn't distinctively different from the Magar villages that dominate the area around Tansen, there were a few new words and some small differences in the food to be noticed. 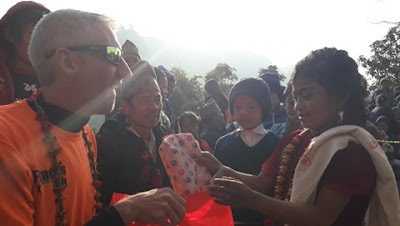 As with the villages around Tansen, Bimala and I received a very warm welcome and were made to feel at home. 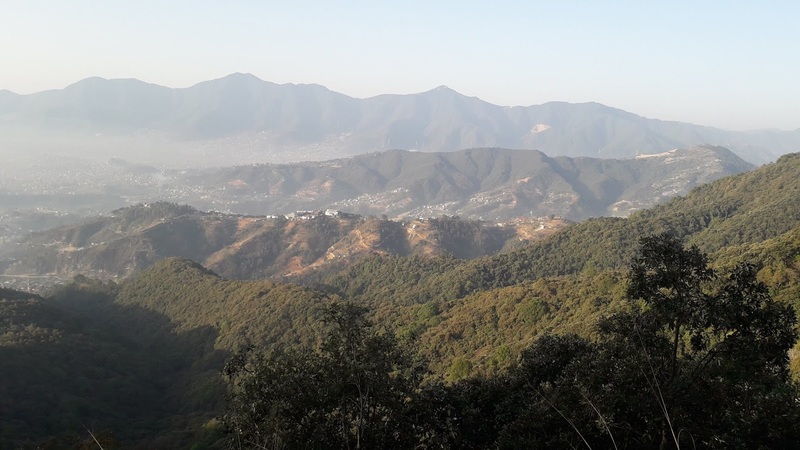 Sanodumma is the home of Mira Rai, who organizes Bhojpur Trail Race annually, to encourage the locals to try running and to give talented runners in East Nepal the chance to compete in a competitive race. 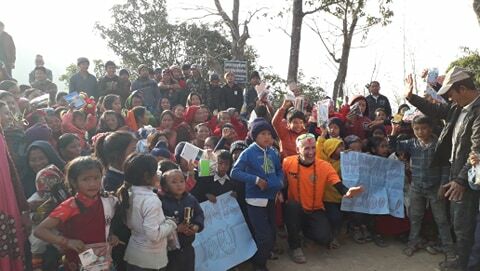 It's well supported by, and in turn, supports, the runners in the Mira Rai Initiative, who are some of the most talented up and coming female runners in Nepal. It really couldn't be more different from the army organized marathon at the start of this post! By the evening Mira has arrived and there were at least three well-established world-class trail runners in the village. Mira herself, Bhim Gurung (who won 4 Skyrunner World Series races in 2016-2017) and Brit Lizzy Hawker, a former 100km world champion and former world-record holder for 24-hour road running. Along with the talented up and coming runners, I was starting to worry I might be about to experience last place for the first time! Friday was the 8km short run, aimed mostly at the village school children but with a few adults also in the field, including Bimala! 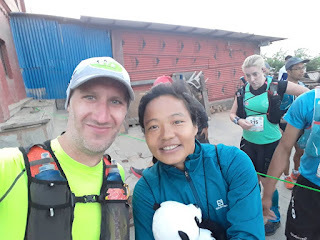 Although I wasn't officially part of the race, I ran with Bimala to give support in her first ever race, which she completed in a very respectable 1-hour and 5-minutes, with a tough climb in the first 3km. The kids we ran with were amazing. Mostly wearing flip-flops, they tore up and down the hills with dangerous looking speed. Saturday was the day of the 36km race. 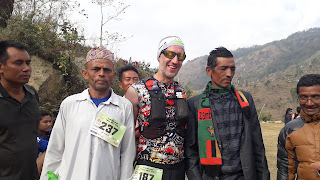 In true Nepali fashion, runners were still registering at 9am, an hour after the race was meant to have started. Many came to run in whatever they happened to be wearing, including the 2 men in the picture with me. There were also plenty of secondary school children, once again many running in flip-flops. My hopes of not finishing last were raised, although that would have been an improvement on my actual result. We had to wait for a government minister to arrive by helicopter and give his speech before the race could start, which meant it was almost 10.30 by the time we got going. It's something I'll never get used to, the casual indifference with which Nepali politicians treat their constituents, and even harder to understand is the lack of anger or any reaction this normally gets. Even so, there would be a few people feeling angry with this minister's lack of consideration by the time the race finished. The race finally got off, but within a few kilometers I was feeling some real stomach problems and looking for somewhere to make a toilet stop, finally finding a suitably secluded bit of jungle. But the time I'd run 10km I'd been into two homes to repeat this and realized it wasn't going to be my day. Another kilometer further on and I met 2 injured runners limping toward the next checkpoint and decided to join them in dropping out, after helping to patch them up with the few bandages and things I kept in my running bag. It was my first ever DNF (did not finish) and as disappointed as I am, I'm determined to go back next year and finish the race. 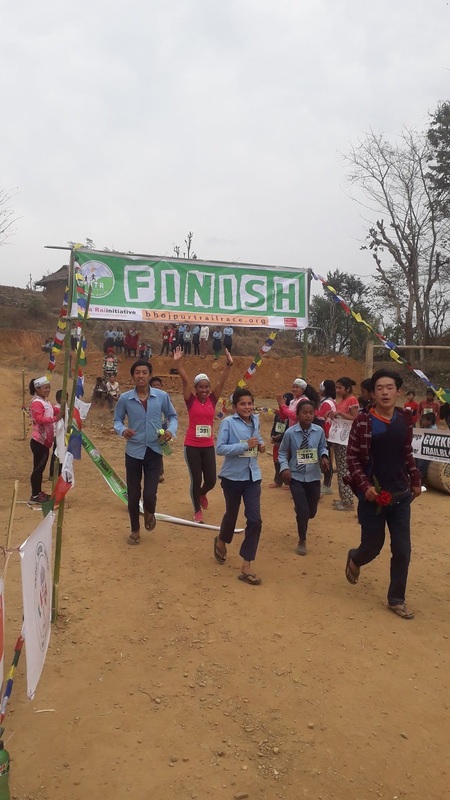 From the checkpoint, we were able to catch a jeep to the finish area in Bhojpur town and see the runners coming in. Soon after, the heavens opened and we were covered in, first heavy rain, then hail. For the runners still on the high hills, with snow covering the ground, these were atrocious conditions that would slow them down a lot and mean many runners didn't finish until well after dark, very cold and very wet. It didn't go unnoticed that had the minister turned up on time, most runners would have at least been out of the high hills before the storm hit, and all would have been able to at least finish in the light. In the end, his late arrival hadn't only been an inconvenience, it potentially endangered lives. Bhojpur town is a lot like how I imagine Tansen to have been 20 years ago. The houses are generally much older and more traditional, although without the Newari architecture and carving that is so noticeable in Tansen. Most of the roads don't have good surfaces and the shops and restaurants make no attempt to be modern or fashionable, so much less English on the signs and less modern comforts to enjoy. But it was great to see a totally new part of Nepal for me and to be reminded that as poor as Tansen, and all of Nepal, is, there are still places with greater poverty in need of help. The bus back to Kathmandu took another 22 hours, with a fairly uncomfortable 6-hour sleep stop. Once there Bimala and I were finally able to celebrate our 4th wedding anniversary properly, before finally heading back to Tansen. Manisha's work here is also proving to be a tough marathon, the current hill to climb being one made of banking problems and simply being able to send money securely from the UK to Nepal. 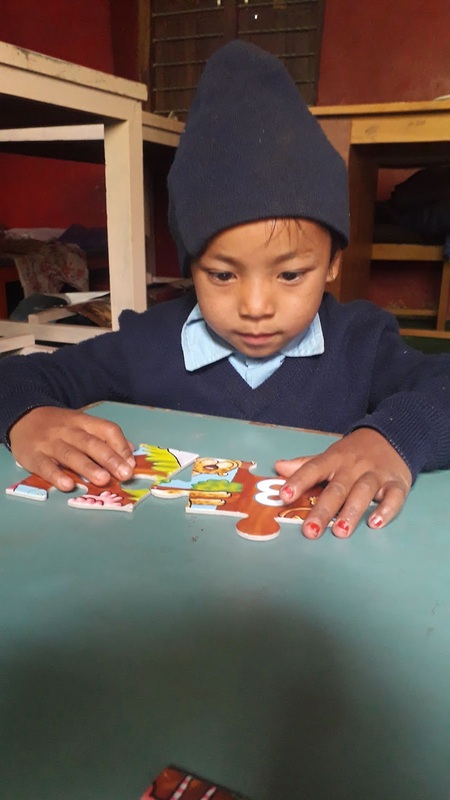 However, unlike Bhojpur, DNF is not an option here and we'll keep persevering until the Learning Resource Centre is in operation. Running that, of course, will be a whole other challenge! It's been a fairly slow start to the year in many ways. Children had a fairly long winter vacation after their exams which made school visits pointless for a couple of weeks and left me at home doing things like lesson planning, which as necessary as they are don't make for exciting blog posts. Work has been continuing at the LRC. 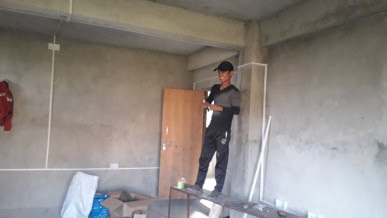 We now have electricity, plumbing, a freshly painted building inside and out and a security gate to keep it all safe. 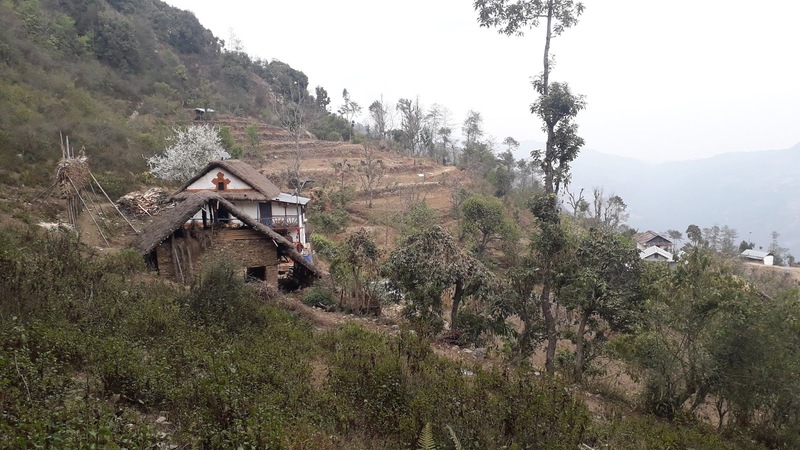 Manisha Nepal Palpa have set up a new bank account ready to receive further funding from UK partners but a delay in getting it activated means we're currently on a slower period and can't do further work until more funds arrive. While contractors have been busy at the centre, I've been planning lessons and starting to prepare resources ready for the centre is finally open. I've now got a good bank of lessons ready that I hope will get children thinking creatively and practising skills, which are both areas that are conspicuous by their absence in most local schools. Many of the lessons come with videos, flashy PowerPoint presentations or other use of tech, but days of heavy rain and very frequent and long power cuts have reminded of the need to plan tech-free backups, which is this afternoons job! I've been continuing to run throughout the month and trying to explore new routes and places. This means I get chased and barked at by many new dogs, but also leave many locals with somewhat bemused looks on their faces as a foreigner wearing funny clothes runs through the village. 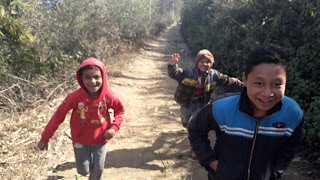 Children who aren't too bemused often wave or call out a greeting or question, some of the younger ones cry when they see but every now and then I meet some kids like the ones in this photo who can't resist running with me for a little while. They're always welcome company but sometimes they do make me feel rather inadequate as I struggle uphill in my expensive trail running shoes and run up laughing effortlessly in their flip-flops! I've also been 'plogging' for the first time. Plogging combines jogging and picking up litter. 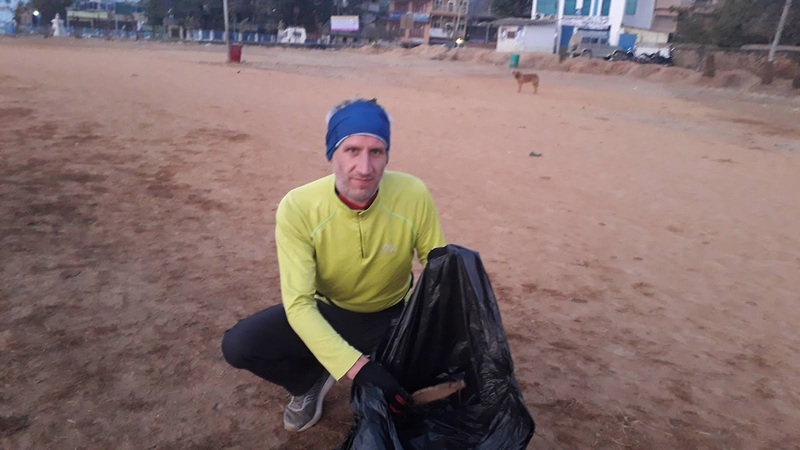 Sadly, there is so much rubbish lying in the streets in Nepal I can't really run between each piece and even a full bag of rubbish barely makes a dent in the problem. But lots of people see what I am doing, and with any luck some of them will think twice about who picks it up before next casually throwing their trash on the ground. Now that children are back in school we've started making a few visits again. 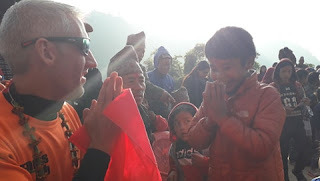 Yesterday, I made the early morning run to Chhap to meet Saran at his home and visit Bhagwati Lower Secondary School in the village. We had great success playing Human Calculator with class 6. The children all where different numbers and move around until I call out a number when they have to get into groups that add up to the number called. It's a great way to practice mental addition, which is another skill often lacking here. All too often in a shop I'll buy a couple of items priced at say, 40 rupees and 80 rupees and watch as the owner gets out the calculator to work out the total! 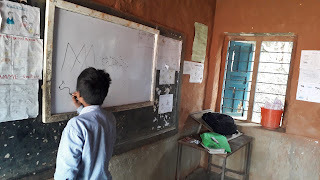 This was followed by Pictionary with class 7. Some students struggled at first, producing some lovely art of the whiteboard but running down their teams time as they took too much care over producing a beautiful picture rather than drawing clues. 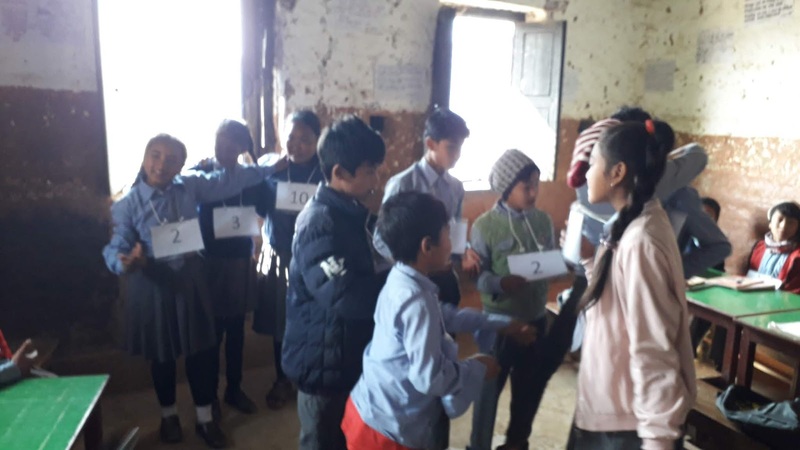 But as students got the hang of the game, and got a little more competitive, it started to work much better and the children really enjoyed themselves. After a quick lunch of chow-mein, we headed to nearby Kalankee Primary School. 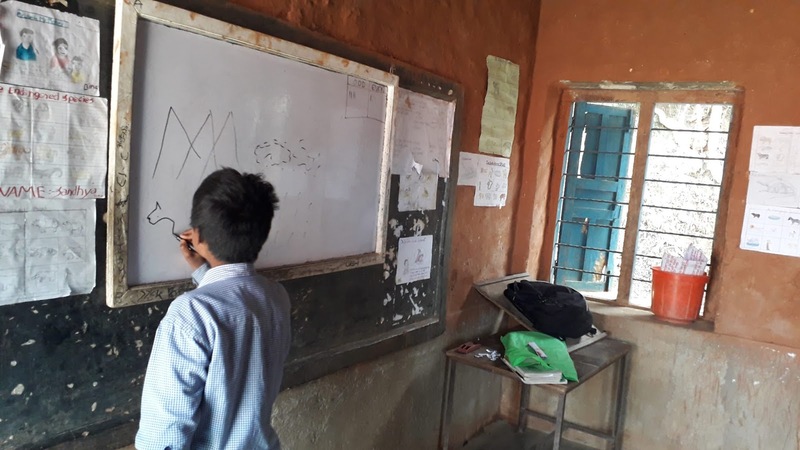 Students numbers have been declining for a while now, due to the success of family planning initiatives, and the school is expected to close after the Nepali New Year in mid-April. We spent some time with the principle discussing what will happen to the children and to the staff at that point. It seems the children and staff will be properly taken care of, but it's something we'll be keeping a close eye on. 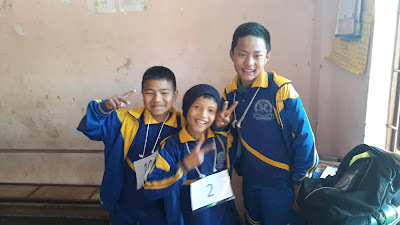 It was a pleasure to see all the students again but especially Binod. 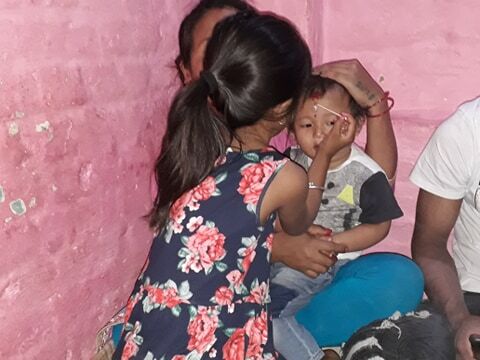 Binod is a young boy from a poor Dalit family with severe visual impairment. Over the last four years, I think we have developed something of a bond. His teacher told me that he often asks when I will visit again which is both heartwarming and heartbreaking. Heartwarming because it is very nice to be remembered and missed and to see that you made an impact with a child but heartbreaking because it suggests no one else is giving him much care and attention that he looks forward to my visits so much. We've asked the school to help us arrange a meeting with his parents so we can look at getting him to a specialist school. Hopefully, we'll be able to meet them soon and make any arrangements needed for the start of the new school year in April. Over the next couple of weeks, hopefully, we'll get the bank account activated and pick up the pace of work at the Learning Resource Centre. I also hope to visit a few more schools, try some more new games and get some more lessons ready. Cleaning out the dust, leaves and cobwebs. 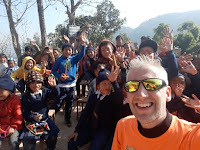 In my last blog post, I announced that we'd formally secured a site for the new Learning Resource Centre that we are opening with the Steve Sinnott Foundation and Manisha Nepal Palpa. Since then we've been busy and have made a good start on getting it ready to open next year. 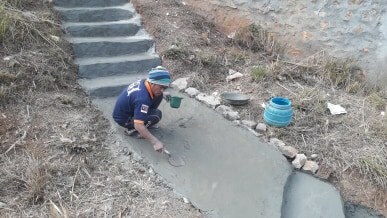 We've built new steps to give easier access to the building and by the end of the day, we should have electricity and running water. Lots more to do, but a great start in a short time. 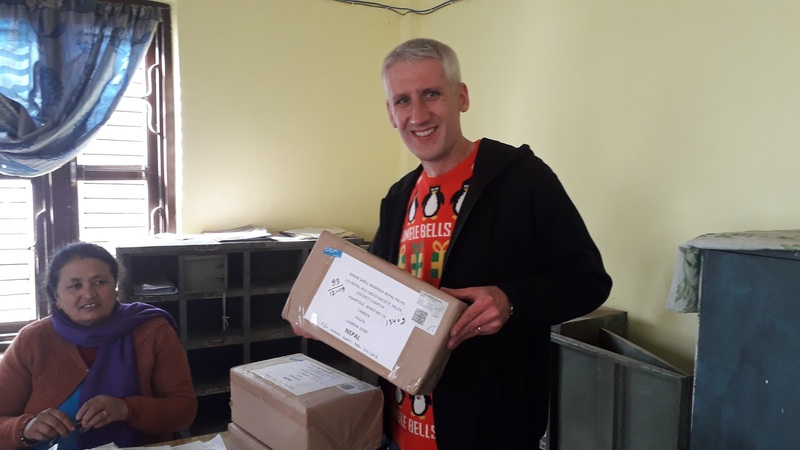 Although most of my focus has been on getting the LRC ready, I was reminded that in the UK many people are celebrating Christmas when on Christmas Day we received 8 shoe boxes crammed with stationary, hats, toys and books from Howard Junior School in Kings Lynn for their twin school, Himalaya Primary in Mahachap. Santa's sleigh obviously made it to Tansen! 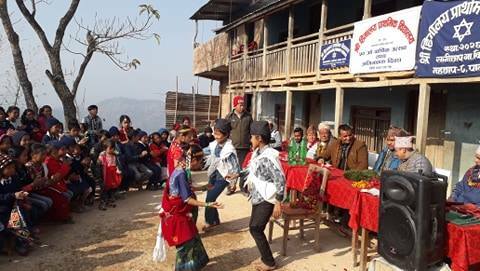 Christmas is not widely celebrated in Nepal, and wasn't even a government holiday this year. However, I had a small celebration at home, eating fry momo and the best part of a Christmas Dinner, roast potatoes! We exchanged a few small gifts, mainly chocolate, which I've been happlily stuffing myself with for the last few days. Yesterday, Himalaya Primary School celebrated its 50th Anniversary AND formally opened the new building that Manisha UK helped to fund along with the local government. I decided that it would be great to take the gifts from Howard Junior School at the same and add to the celebrations! I decided to make the trip my final run of the year and enjoyed 12km of undulating jeep track and some hazy views of the Annapurna Mountains on the way. Miraculously, I wasn't harassed by a single dog for once! As usual at these events, we had to sit through lots of incredibly long, tedious speeches by local politicians. It never ceases to amaze me that they can continue talking for so long, even though it's very clear no one is listening as everyone has their own conversation. But eventually, the ribbon was cut on one big Christmas present, the new school building. 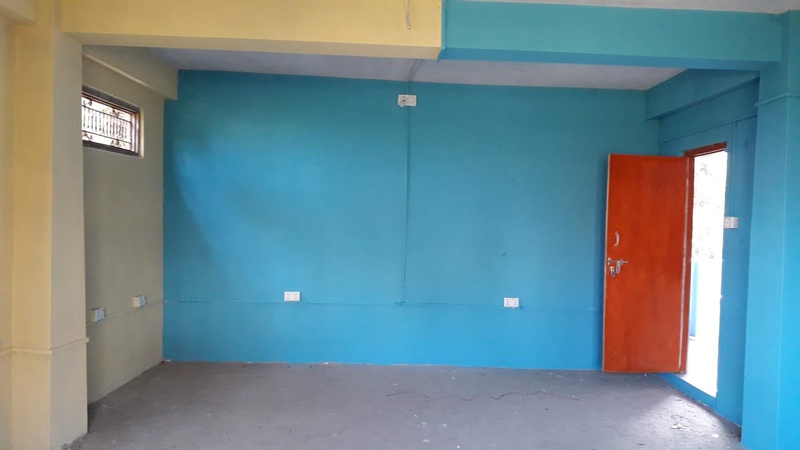 This is such a huge improvement on the old building, where desks sat on uneven mud floors and noise carried from room to room. And most importantly, it's safe and children no longer have to study in classrooms that were officially condemned after the earthquake almost years ago! After a few more speeches, and being repeatedly promised we'd be able to distribute the gifts next, impatience got the better of me. During another long, droning speech, I started calling over children and asking them to round up everyone in their class and make a line for the lucky dip. Once others saw what was happening, it wasn't hard to get them all over to me! We'd put stationary into sets and left other prizes, such as hats, on their own so that everyone would go away with a great gift. Children in Nepal so often lose their smiles as soon as a camera is pointed at them, but I can assure you there were plenty to be seen! The speeches were occasionally punctuated with dance. These children are wearing tradtional Magar dress. The signs should read "Thank You Howard Junior School". That's pretty much it for 2018. 2019 promises to be a very exciting year, with the new Learning Resource Centre opening and continuing our work with the village schools. Keep checking my blog, as well as facebook.com/manishauk for the latest news. 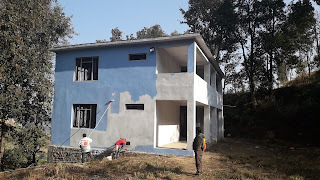 The signatures are on the lease agreement and the ink is dry, we have now officially secured a site for the Steve Sinnott Learning Resource Centre in Tansen! 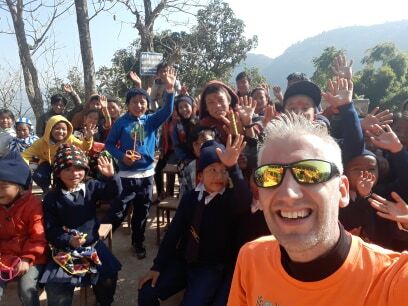 Of course, getting the LRC ready needs funding, and a secure, legal way to transfer funds from the UK to Nepal. We've had some issues with the bank we were using in Tansen, Saran, Sagar and I took a trip to Kathmandu to open a bank account that could offer a more complete and professional service. As is so often is the case here, things didn't run exactly to plan and we were unable to get the new account open there and then, although it should happen before Christmas. We did, however, manage to register Manisha Nepal Palpa (Manisha UK's sister charity in Nepal) with the Social Welfare Council. This gives us some of the documents required for opening a more appropriate type of bank account, for visa applications and for obtaining any tax exemptions and help we are entitled to. There isn't a lot of content right now, but check back regularly and as we progress further you'll see more and more of what we are doing there. If you keep up with this blog regularly then you may have noticed I haven't posted in a while. I've been waiting for some exciting news to become official, and although it still isn't quite official I've run out of patience so am going to share it anyway! We've (almost, nearly, very close!) signed an agreement for a building for our Learning Resource Centre that we are opening with the Steve Sinnott Foundation. It's a great building, purpose-built for education and we've agreed (and almost signed!) good terms. It's been a long process to get here with a number of options we had pursued previously falling through, so it's safe to say I'll be having a glass of something when we finally get signatures on the paper. That's not all we've had to celebrate. Before that, we had the 5 day Tihar festival, which is the Nepali version of Diwali. The different days celebrate different gods, many of which are represented by animals. So it's pretty normal over these few days to see dogs and cows wearing tikka and mala, although they don't always seem to happy about it! 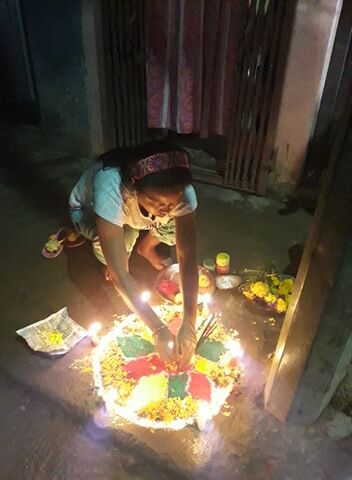 The 4th day is devoted to the goddess of wealth, which is when everyone lights up their houses and makes rangoli patterns to encourage the goddess to visit. I can't help notice that people seem to take this more seriously that the previous days, altough despite my wife's best efforts she seems to have missed us! Traditionally on the final day sisters give presents to their brothers but in the name of SDG goal 5 (Gender Equality), it was gifts all around in our house. As well as giving and receiving gifts there is decorative tikka worn on the forehead and lots of food, most notably a variety of different breads. Yet another reason to celebrate, my younger brother, back from working in Malaysia for a month-long visit, got married. We had a small ceremony in the home, followed by much eating and dancing. This was followed a couple of weeks later by about a dozen family members pilling into a jeep to visit his wife's old home in her village for the big party. In truth, I don't find much to celebrate in Nepali weddings anymore. Daughters-in-law are very rarely treated as daughters and from the morning after the wedding are expected to do the majority of cooking and cleaning for their new family. Sadly, even my own Nepali family are not an exception to this, despite my complaints. But credit to my brother-in-law who does his best to help her. The new building at Jandeep looking fantastic and much safer than the old rooms. Now Saran and I are busy collecting estimates for work we want to have carried out on our new building. Although the building is in great condition there is still plenty to do. But as soon as the ink is dry on the contract we'll be able to get started on the real work!